Ok so I am not usually this quick to post a recipe but the reaction to the picture of the cookie dough brownie bombs was so crazy, I thought well I best get this post up or these people are going to beat me to death with a wooden spoon. So here I am, Friday night, writing about these fabulous things. Now, I will be straight up and say these are not my brain child. A woman named Hayley from The Domestic Rebel, is the amazing genius behind these little pieces of heaven. All hail the queen. She is my hero. You know how sometimes you see a recipe on Pinterest and get all worked up because it looks so good and then you make the recipe only to be disappointed? Yeah, I kind of wish I could say this but it is so not the case. These babies are even more delicious than you could begin to imagine. They taste even better than they look…can you imagine? You ready to make up a batch of these beauties? Ok let’s get started. You are so close to chocolate heaven. Ok after you have your brownies baking, start making your cookie dough. Using a stand or hand mixer, cream together the butter and sugars. Then add in the vanilla and milk. Mix that in nicely. Now add your salt and gradually beat in the flour. Now mix in 1 cup of the mini chocolate chips. Now, you are going to make the cookie balls. You want to take about 1 scant tablespoon of dough and roll it into a ball. Take a measuring tablespoon and barely fill it. You will get a general idea of what size they will be and make them as uniform as possible. I laid a silicon baking mat on a 13 x 18 cookie sheet and put my cookie balls on there, but you can also use foil or parchment paper. It will look like this when you are done. Now take the cookie sheet and slide it into the freezer for about 30 minutes. If you don’t have a wide enough freezer for that big of a cookie sheet, just use 2 smaller cookie sheets. No biggie. 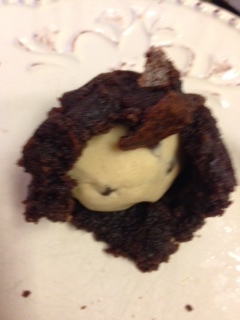 And then continue to work the dough around the cookie ball until it is as covered in brownie dough as possible. 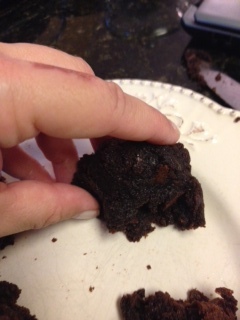 The brownie dough will become more pliable as you continue to work it around the cookie ball. That is how it will end up looking all the way around. 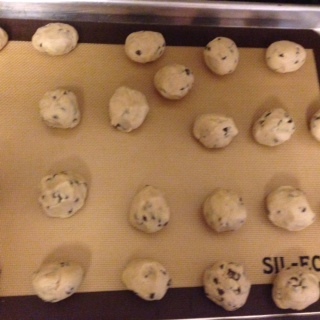 Lay them back down on the silicone baking mat/foil/parchment paper cookie sheet. Now, you want to put the brownie covered cookie balls back into the freezer for about 45 minutes to an hour. Calm down, the time the will pass quickly. You are so close my friend. So close. And there will be some left over cookie dough balls…so nibble on that to get your sugar fix. You can do this. Ok now when you are about to pull the brownie covered cookie dough balls from the freezer, melt your chocolate Candiquik according to package directions. This is much easier and involves less clean up than if you melt chocolate almond bark in a double boiler or a pot, but if that is what you feel more comfortable doing than feel free. Knock yourself out. I am assuming if you are following my blog you are like minded and think “ain’t nobody got time for that!” but we still love you and you are still welcome here. 🙂 Alright, compose yourself and pull the balls from the freezer. You will need a large piece of parchment paper at this point. Now using a fork, roll each brownie covered cookie dough ball around in the chocolate Candiquik until it is well coated. Let the excess drip off and then put it on the parchment paper. 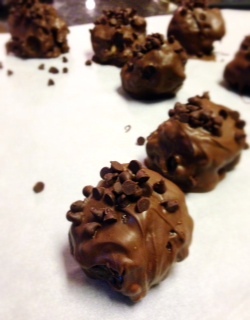 Sprinkle some of the remaining chocolate chips over the top of the chocolate covered cookie dough ball. 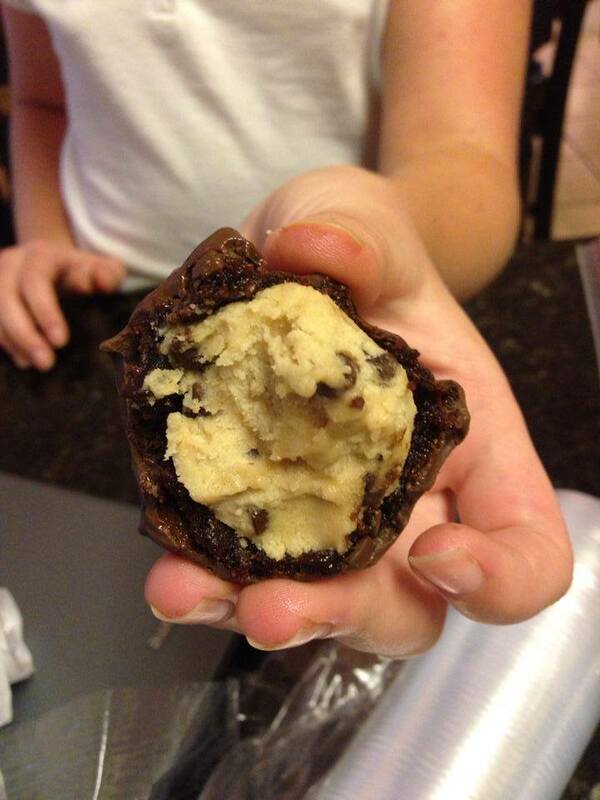 And let it sit there will you do the same thing to the remaining brownie covered cookie dough balls. Get ready to slap little (and big) hands away because husbands and children will be begging you for just one. This will make about 18 cookie dough balls, maybe more depending how big you make your cookie dough balls. Also, it depends how many brownie squares you cut your brownies into. But about 15-18 is what you can expect if you follow these directions. Give or take a few. Ok, after you are done rolling all of the balls in the chocolate and have sprinkled them with chocolate chips they will look like this… . Wipe your face…you’re drooling. And when you bite into them, they will look like this… . You’re welcome. Enjoy your Saturday!!! Let me know how you and your family like them. Or love them.